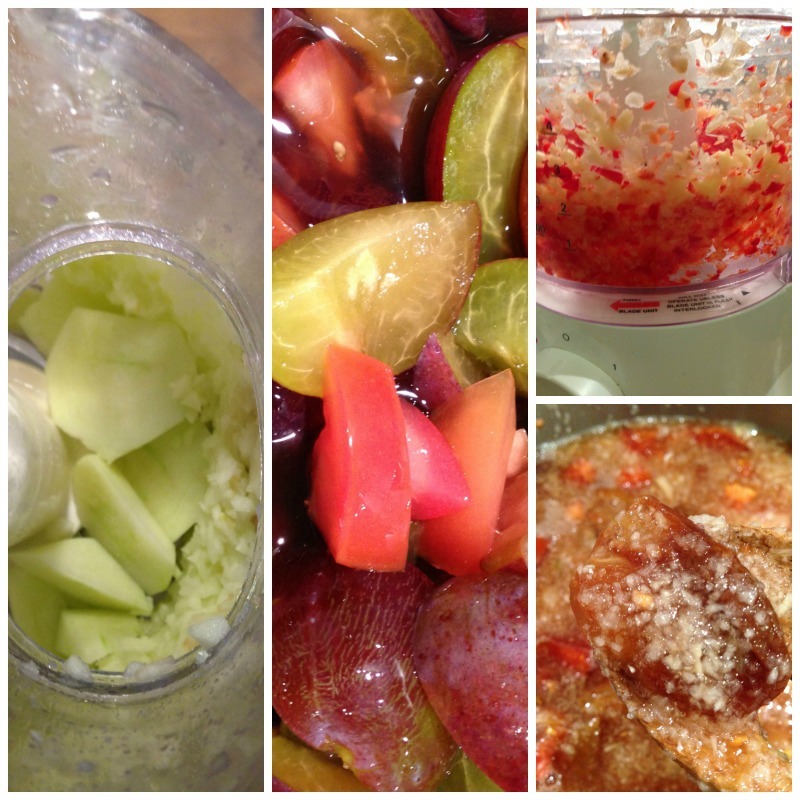 You ask your husband for a simple post about how to make chutney, and this is what you get. Chop up a load of fruit and veg, plunge it into vinegar and sugar, and add some spices, salt and raisins. That’s it – it’s easier than a Bolognese sauce. 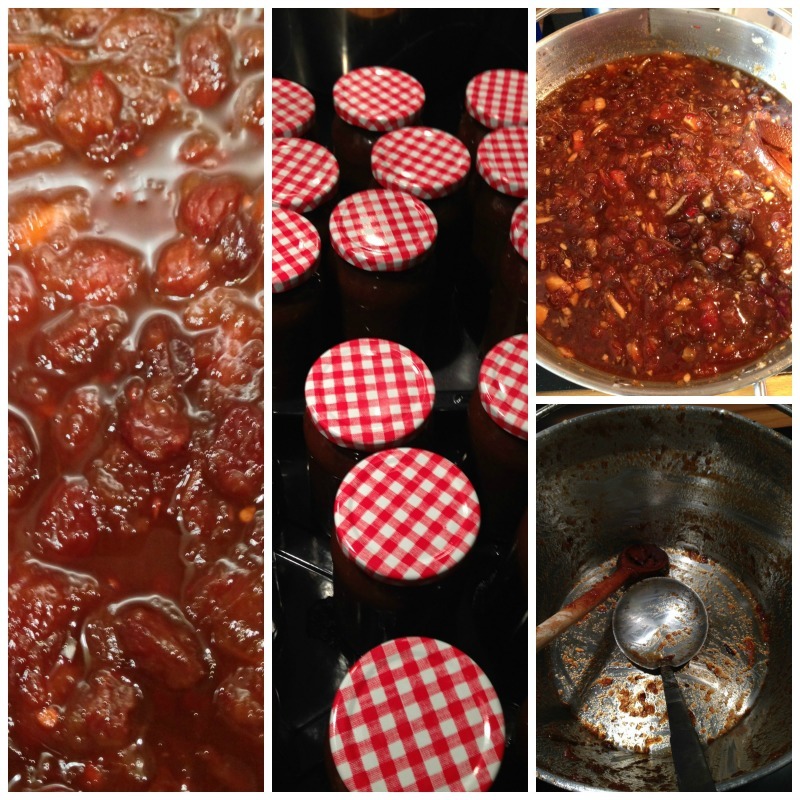 If, like me, you find it hard to follow recipes without adding your own twist, try adding too much chilli, realising your mistake, and making a whole second batch of chutney that you can combine with the first one, to tone it down. We got the cooking apples from our garden, and the plums from my mum’s garden. The tomatoes came cheaply from the local corner shop, because they were going soft. Take the biggest saucepan you’ve got and pour the whole pint of vinegar into it. Cut the plums in half and remove the stones, then cut the halves in halves, and chuck them into the vinegar. Now chop the tomatoes roughly and add them to the vinegar. Then stick the iplayer on and peel and chop the apples and onions, and whizz them in a food processor, before adding to the pan. (Before we had a food processor we just chopped the apples and onions finely). Peel the garlic, chilli and ginger, and whizz them in the food processor. How much you use depends on how hot you like your chutney – I used two whole chillies and five cloves of garlic, and had no idea how much fresh ginger corresponded to preserved ginger, so put a two inch piece in. The result was too hot for me, but Hannah really liked it. Why not start with a third of these amounts? Add the last ingredients to the pan, together with the sugar and salt, and heat everything very gently. Be careful not to heat too quickly as the chutney-to-be can catch on the bottom of the plan and burn really easily. Simmer until it all looks like chutney. I tend to leave the mixture to cool, then see whether it has that gloopy chutney look about it. If it does, heat up the mixture again before ladling it, still hot, into the jars and screwing the lids down. The cooling chutney creates enough of a vacuum to pull the lids down tight. Delia refers to discs of greaseproof paper, and covering the lids of the jars, but I’ve never had chutney go off when not using these extras. Finally, as you sit down to the first meal that could do with a bit of homemade chutney on the side, reflect on how odd it is that chutney is a Sanskrit word, wholehearted adopted by the British to reflect the addition of chilli and garlic to a fruit preservation process that has been carried out on these shores for centuries. And then start to wonder about the history of apples in Britain….. 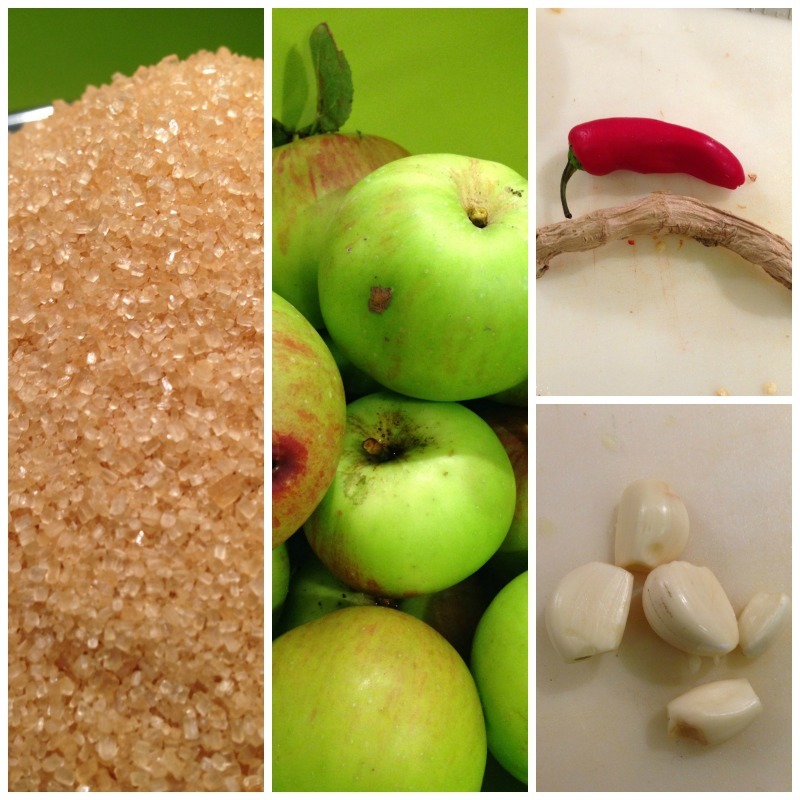 This entry was posted in Food and tagged chutney on November 2, 2013 by Hannah.